Sherburne SWCD has sent our Letters to landowners who appear to have compliance issues based on satellite imagery. The SWCD will work with landowners who request assistance in evaluating alternative practice options. If you have received a letter or have questions about Buffer compliance, please contact our office at 763-220-3434. Require a 50-foot average width, 30-foot minimum width, continuous buffer of perennially rooted vegetation. Buffers are measured from the top or crown of the bank. Where there is no defined bank, measurement must be from the edge of the normal water level. Buffers are measured from the top or crown of the bank. All parcels in the county are to be reviewed within a 3 year timeframe. 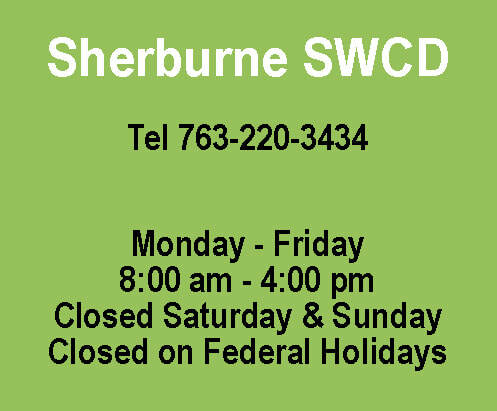 Sherburne SWCD staff will review 1/3 of parcels each year. Tracking will include parcels affected by the public waters and public ditches. Staff will complete the review utilizing updated aerial imagery, site visits, or a combination of methods. Landowners will be notified prior to staff visiting the property. Random spot checks will be done in addition to the tracking of all parcels within a 3 year span. These checks may be conducted via aerial photo review or on-site review depending on availability of updated aerial photos and access to the property. A combination of both aerial and on-site review may also be used. The SWCD will conduct 5-10% of parcels on a random spot check review each year. Additionally, the SWCD will review parcels of emphasis more frequently.